Bionix II is the latest variant of the Bionix infantry fighting vehicle produced by Singapore Technologies Engineering. Bionix II (BXII) entered service with Singapore Armed Forces in October 2006. Bionix 25 (left) is armed with 25mm cannon and Bionix 40/50 (right) with 40mm grenade launcher and machine guns. 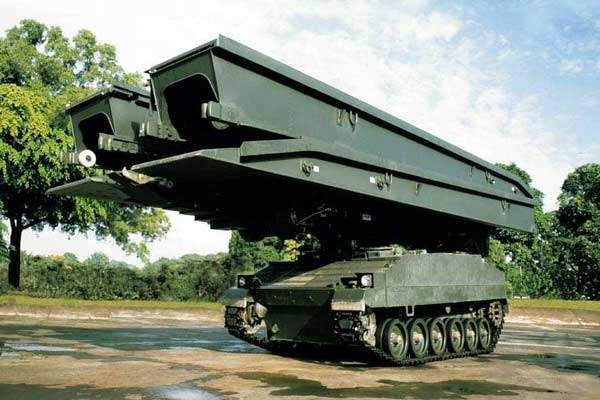 The Bionix armoured vehicle launched bridge (AVLB) is fitted with an MLC30 bridge that can be launched under armour or by remote control. The Bionix armoured recovery vehicle (ARV) is fitted with a 25t winch and 30t crane. The Bionix infantry carrier vehicle (ICV), with remote weapon station, was developed by Singapore Technologies as a private venture. 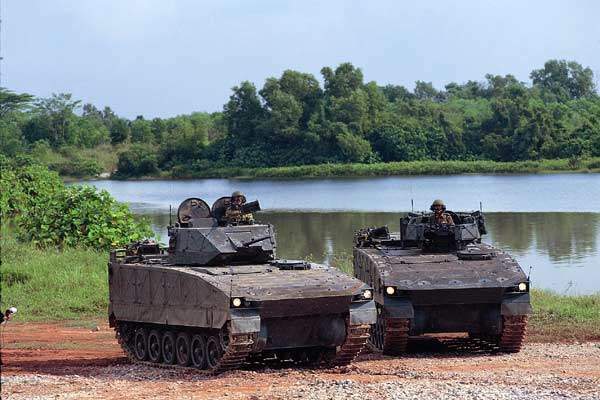 The Bionix infantry fighting vehicle was developed by Singapore Technologies Automotives (now Singapore Technologies Engineering) and has been operational with the Singapore Armed Forces since 1999 in the form of the Bionix 25 and Bionix 40/50. Bionix II (BXII) entered service with Singapore Armed Forces in October 2006 and was jointly developed by ST Engineering, the Defence Science and Technology Agency (DSTA) and the Singapore Army. Bionix II is also produced in a command variant. "The Bionix infantry fighting vehicle was developed by Singapore Technologies Automotives." 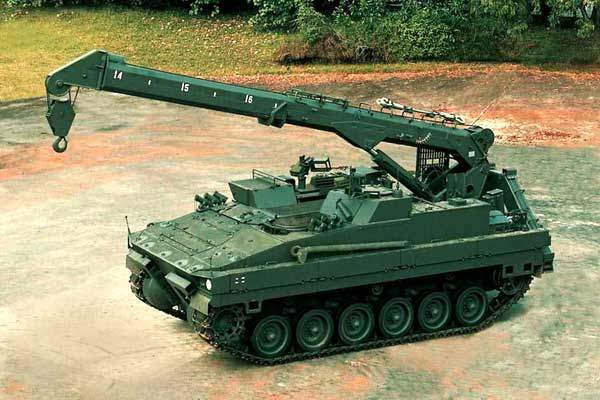 Other vehicles in the Bionix family are the armoured recovery vehicle (ARV), fitted with a 25t winch and 30t crane, and armoured vehicle launched bridge (AVLB), fitted with an MLC30 bridge that can be launched under armour or by remote control. 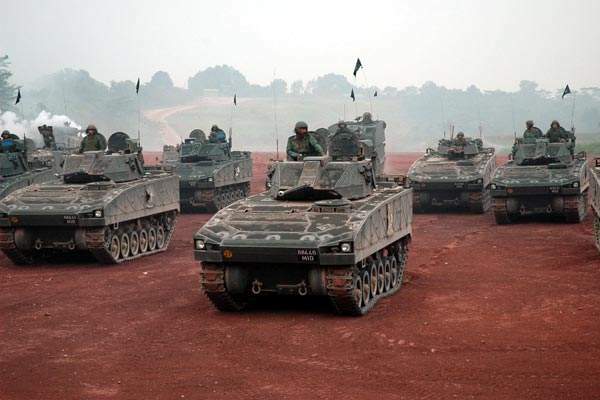 An infantry carrier vehicle (ICV) variant was developed by Singapore Technologies as a private venture and offered for the US Army’s interim armoured vehicle, a competition won by the General Dynamics Stryker ICV. Bionix II has common hull, power pack and suspension as the previous vehicles but is equipped with a network-enabled digital battle management system, a new ATK mk44 Bushmaster 30mm dual-feed cannon and modular armour package. It has a two-man turret and can accommodate up to ten troops. It is also armed with one 7.62mm coaxial machine gun and one 7.62mm general-purpose machine gun. Bionix II has an improved day / night thermal sighting system (DNTSS) with a dual-axis stabilisation system for enhanced target tracking. An integrated eye-safe laser rangefinder has a range of up to 3km. Bionix 25 has a two-man turret and can accommodate ten troops. It is armed with an ATK M242 25mm Bushmaster dual-feed cannon with vertical and horizontal stabilisers. The cannon has 180 ready-to-fire 25mm rounds plus 420 rounds in the ammunition store. The cannon fires HEI and APFSDS rounds manufactured by Chartered Industries of Singapore (now Singapore Technologies Kinetics) under a licensed manufacturing agreement with Oerlikon Contraves. The gunner has an 8x magnification day and thermal night sight with two fields of view for the 25mm cannon. A laser range finder can be optionally fitted to the day and night sight. There are three general purpose 7.62mm machine guns, one mounted co-axially with the 25mm cannon, one roof-mounted for anti-aircraft use by the commander or gunner and one rear mounted gun on the right side. The vehicle has six 76mm smoke grenade launchers. 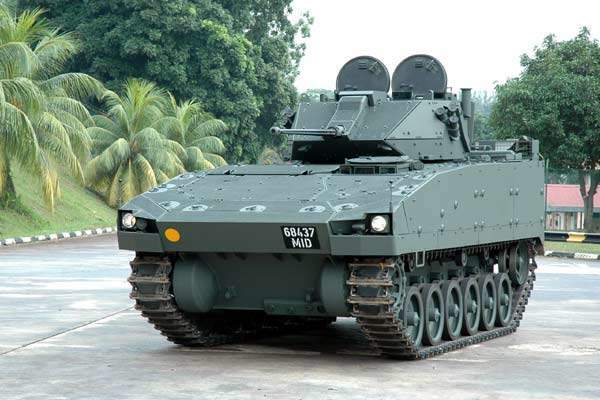 Bionix 40/50 is fitted with a one-man 40/50 cupola manufactured by Chartered Industries of Singapore and can accommodate 11 troops. It has a twin weapon station with 40mm grenade launcher, 7.62mm and 12.7mm machine guns. The two-man Bionix turret is of all-welded-steel-armour construction. Additional armour protection can be installed with an add-on layer of spaced passive armour. The gunner’s station is on the right and the commander’s station is on the left, each with a single hatch cover. "Bionix 25 has a two-man turret and can accommodate ten troops." The turret traverses through 360°. The turret traverse and weapon elevation is by all-electric digital control. Both the gunner and commander have a turret stop button and are able to lay and fire the weapons. Three day-periscopes give the gunner a field of view to the right and to the rear of the vehicle. The commander has a secondary optical relay from the gunner’s sight and five day-periscopes with fields of view to the front, left and rear. The hull and turret are of all-welded-steel construction with modular passive armour protection. Access to the troop compartment at the rear of the vehicle is by a power-operated ramp, which can operate as an emergency access and exit door. A single hatch is installed over the troop compartment. The driver’s station has three periscopic sights. The two outer periscopes are day sights while the centre periscope can be rapidly changed between a daytime scope and an image-intensifying night scope. The power pack, which can be easily removed in the field in less than 15 minutes, is installed at the front right of the vehicle. The Detroit Diesel 6V-92TA turbocharged diesel engine develops 475hp at 2,400rpm, with potential of achieving 550hp. The engine is equipped with electronically controlled diesel injection. The engine compartment is fitted with an automatic fire detection and dry-powder fire suppression system with a supplementary manual back up. The vehicle is equipped with automatic hydromechanical HMPT-500EC transmission and final drives from General Dynamics Land Systems. The cooling system, supplied by Galley, was designed to give the vehicle a low thermal signature. The two fuel tanks of total capacity 562l are installed on either side and in the upper part of the hull. The Hydrostrut suspension from Horstman Defence Systems, based in Bath UK, gives stability for operating weapon systems and comfortable riding conditions. 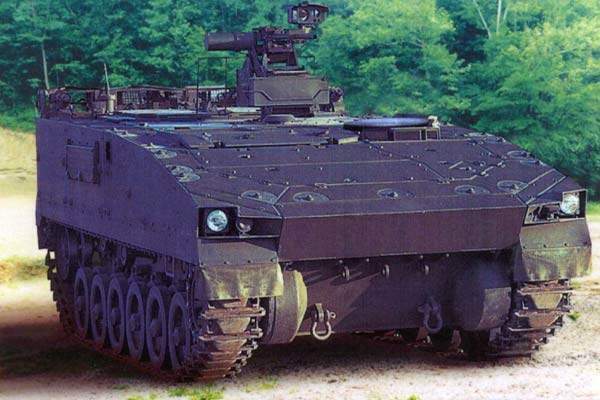 The suspension is hydropneumatic and is based on the proven Hydrogas suspension unit fitted on Challenger tanks and AS 90 self-propelled howitzer. "Bionix has manoeuvrability over obstacles, including a 2.2m trench and 0.8m vertical steps." The vehicle has 77-link single pin cast tracks and six dual tyre wheels on each side. Bionix has road speeds of 70km/h and 25km/h to 40km/h across country. The range is 415km at a speed of 45km/h without refuelling. Bionix can negotiate gradients to 60% and side slopes of 30%. With a turning radius of 9.9m and 6.5m with a pivotal turn, the vehicle can manoeuvre in urban environments and in confined spaces. Bionix has manoeuvrability over obstacles, including a 2.2m trench and 0.8m vertical steps and is capable of fording to a depth of 1m with preparation. The vehicle is fully amphibious with an optional kit.